Thanks to the exhibition of our pupils' works at West-Slovak museum we became radio stars for a moment. On May 10, 2018 PhDr. 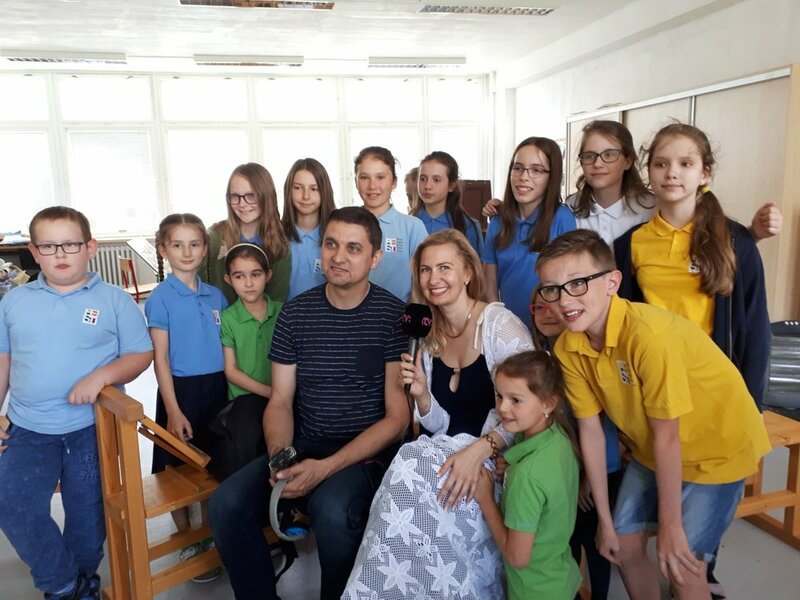 Martin Jurčo, a RTVS reporter from Regina radio visited our school to see how our artists are doing at Art Studio. At this occasion he made an interview with young artists. A group of pupils from Trnava, called IT-PRO-BESST, made their way to the finals of championship in Detroit, USA, thanks to their hobby in building robots out of LEGO MINDSTORM building blocks. At the end of April pupils from Billingual English-Slovak School Trnava won a fantastic 3rd place out of 104 competitors. The world-famous LEGO builder can be packed in any way, even a robot that changes the child's play to the first scientific experiments. The pupil of the BESST English-Slovak bilingual school in Trnava has been dedicating to LEGO Mindstorms for a long time and has won the 9th place amongst the European Central Teams in Germany. Thanks to this performance, they will be demonstrating their scientific talent at the world championship in Detroit, USA. On February 9th, 2018 attend a press conference about international projects Supertrieda and Ornamentálna mapa Slovenska in Bratislava. What’s extraordinary about the Night with Andersen, the Week of Reading out loud, or the Bookmarks connecting Schools? These are events to support and develop reader literacy in collaboration with school libraries that we regularly organize at our school. Our teacher Ms. Adela Melišekova-Dojčanová wrote a paper concerning these events that was received in the International Proceedings of the Conference of Educational Change Paradigms. See the full post on pages 179 - 194. Dear Teacher, we had very good and pleasant feelings from the visit in your school. I was particularly surprised by children who were ready, disciplined, and clever. The work of teachers is clearly easy to see and believe me that I know what I'm saying - since I visited more than 180 schools. It is difficult to overlook areas where the teachers particularly pay attention to pupils and truly focus on work with them. I also noticed that the teachers paid attention to my narrative, too which made me very happy. I hope the children will take something from my books and will learn and remember the beautiful moments together with Gordon. They gave me the energy that everyone is lacking today ... Thank you again, we send our best regards to you with my husband, we wish you beautiful holidays, a successful and especially healthy new year, and Gordon sends you a handshake with his paw and the big lick on the cheek. In September, our teacher, Ms Pollákova, attended 2-day The Future Classroom Scenarios Workshop. The workshop gives participants an opportunity to explore innovative approaches and technologies to enhance classroom delivery, and work with other teachers from across Europe to develop new ideas for everyone's own classroom and school. The course was designed to give a hands-on approach to help participants develop their own ideas about 21st Century Learning and the effective use of technology. The workshop has been organized as part of the Future Classroom Lab (FCL). The Future Classroom Lab (FCL) is an inspirational learning environment in Brussels, challenging visitors to rethink the role of pedagogy, technology and design in their classrooms. Through six learning zones, visitors can explore the essential elements in delivering 21st century learning: students' and teachers' skills and roles, learning styles, learning environment design, current and emerging technology, and societal trends affecting education. Seven young LEGO researchers moved trough to the next round of First LEGO League (FLL) competition to showcase their robot in Sydney. First LEGO League is the biggest international robotics and programming competition for students aged 9 – 16. Ten thousands of children from around the world participate to move trough to the semifinals and finals up to world festival. BESST students supervised by their coaches had formed IT-PRO-BESST team which represented Trnava and Slovakia at Asia Pacific Invitational in Australia held on 21 June 2017. Grade nine students in Slovakia took standardized tests in Slovak language and literature and Maths. BESST students ranked first among Trnava schools fourth time in a row this year. Thanks to this ongoing success our school has became the second best school in Slovakia. FC Spartak Trnava players participating in “Angels for Children” project came to visit our school. Oravec, Kadlec and Halilovič introduced their team and talked about its past and what lies ahead. The presentation was followed by Q&A, showcase of their football skills, and competitions. Thank you, Angels! Click HERE to read the full article on netky.sk. Slovak students to move through to the First LEGO League World Festival in the USA again! Slovak students aged 9-16 took part in the international First LEGO League tournament which consist of four equal parts; Robot Game, Robot Design, Research Presentation and Team Work, for the 9th time. 90 teams registered for this year regional tournaments, the best moving through to the Central European rounds organized by Hands on Technology to compete among 955 teams. 127 winning teams competed in 7 semifinal rounds; 24 best teams met in FLL Central European Finals 2016/2017 in Regensburg on 3rd and 4th March. BESST students took part in the “Spartak Fans” project that focuses on new generation of local football fans. Grade 4 went to see FC Spartak Trnava vs Spartak Myjava match and you can check students’s first cheering session in the video (min 4:28). At occasion of the Slovakia vs Scotland match our Grade 1 students welcomed members of Tartan Army Sunshine Appeal. The Tartan Army members who wore their typical tartan clothes had prepared ceremonial for the children to talk about mental health, stress and every day problems children face. Coping with everyday difficulties are taught through Zippy’s Friends programme at BESST.